It’s 2015, and marketers and businesses alike are looking for new ways to get traffic to their social networks. The main social networks have all announced new features to be rolled out during the year, and the buzz of potential has never been greater. Over the past four months, Facebook has announced several different new features, as well as tweaks to their news feed algorithm. Three of these features especially have social media people talking about the possibilities for even better Facebook marketing. A relatively simple addition, Call to Actions on Facebook Pages opens the door for new and different ad campaigns and techniques. From “Shop Now” to “Play Game”, the new Call to Actions are a vital real estate space on a public Facebook Page. The Call to Actions can point to a web page, or even an app. The Call to Actions on Pages join previous functionality for Facebook Ads, making these Call to Actions a vital part of an organic Facebook marketing strategy, and a must-have on all Facebook Pages. While audience targeting has been available for many months in Boosted posts and Facebook Ads, this functionality has been lacking for non-Boosted posts. In December, Facebook announced that it was implementing Interest Targeting for Pages, allowing users to target subsections of their Page Likes with specific content. For example, if one is posting about the effect of social media on a Presidential campaign, one could target people who like both their Page and a particular candidate’s Page. The possibilities for this are endless, as Page admins can now selectively curate content and interact with sections of their audience they may have never been able to reach before in their Facebook marketing. Also in December, Facebook announced it was rolling out Smart Publishing to select media organizations, but would roll the feature out to all pages in several months. Smart Publishing is a unique way to automate Facebook content curation for Pages which receive a decent amount of shares on Facebook. Content curated by Smart Publishing does not appear on a Page, but appears in the News Feed of those who like the page. For example, Buzzfeed may publish an article that receives a large number of shares. With Smart Publishing, Facebook will automatically share this post as the Page, and share it to the News Feeds of Buzzfeed’s audience. 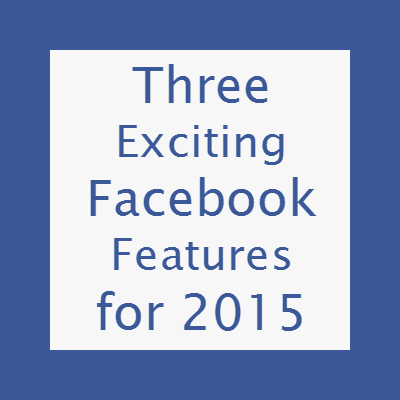 Facebook has stepped up their game in 2015 with new features for Pages. What do you plan to do to utilize these features in your Facebook marketing?